Unlike most federal agencies, the Office of Personnel Management is fortunate enough enjoy “home delivery” of fresh farm products. 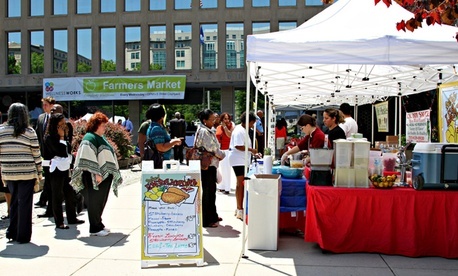 Every Wednesday in season an array of local farmers and food vendors sets up booths at the entrance to OPM’s main building at 19th and E Streets NW in Washington. Everything from ripe red tomatoes to made-on-the-spot fruit smoothies to empanadas is available to employees and visitors entering and exiting. One of the biggest fans is OPM Director John Berry, who bought his lunch there on Wednesday after chairing a monthly meeting of the National Council on Federal Labor-Management Relations. Berry even promoted the farmer’s market to his high-powered colleagues on the council, though he was careful to say he’s not supposed to favor one vendor over another.